With POS from RMS, we have you covered, no matter what size your pharmacy. 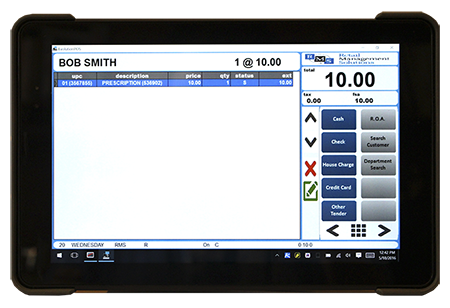 With EvolutionPOS from RMS, one device can solve your patient discharge needs. We’ve taken another generational leap forward in improving what has become the go to mobile POS device for pharmacies! Everything you need from one simple mobile device. Take an evolutionary step forward in customer service and staff efficiency! Helping you continue patient care at the counter, at the bedside, and at the home. Using technology to go BEYOND the typical patient engagement! Retail Management Solutions is the industry leader in pharmacy point of sale technology for retail and outpatient pharmacies. Having installed more pharmacy POS systems in the independent and outpatient pharmacies than any other company, RMS has become the industry standard. Whether you operate a single register pharmacy, 15 register superstore, or have multiple locations, we have a fit for you. You can count on us for prompt service in all 50 states, 24 hours a day, seven days a week. RMS is proud to be the only pharmacy POS software provider in the nation that focuses strictly on the pharmacy market. Did you know we publish weekly articles on pharmacy retailing? Sign up to learn tips and tricks to become more efficient and profitable in your pharmacy!